We are busy preparing for our fall board of directors meeting, so you can only imagine the hustle and bustle around the office (very different from the peaceful serenity found in the garden). We are looking back over the last six months at some key projects we’ve been working on and there is one in particular I want to share. 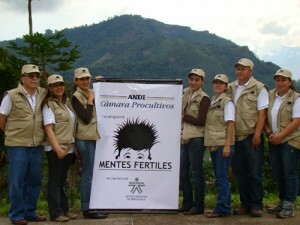 Just one year ago, Nutrients for Life Colombia formed a chapter, and they have reminded us of the importance of educating the appropriate audience. For Colombia, that audience is the source of Colombia’s food supply: farmers. Who better to talk about fertilizer with than those who use it in their everyday lives? Through the Nutrients for Life Foundation Colombia presentations, farmers have the opportunity to learn about best management practices that will lead to increased production and the promotion of the role nutrition plays in ensuring a profitable and sustainable agriculture. Very interesting. Thanks for the education. 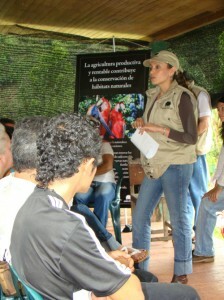 Mentes Fertiles Colombia has been a great opportunity for local farmers. They appreciate the information and most of all the time invested by the Fertile Minds instructors to let them grow their understanding about fertilizers.